BASED IN THE UNITED KINGDOM, THE UNDERWATER PHOTOGRAPHER OF THE YEAR COMPETITION is probably better known in Europe than in the United States, but it draws entries from around the world and the photos are fantastic. The group has just announced its 2018 winners, competing in eight categories – Wide-Angle, Macro, Portrait, Compact, Behavior, Black & White and Up and Coming – plus three British Waters categories, Wide Angle, Macro and Compact. Here are two samples. You can view the all 110 winning images, plus a list of more than two dozen sponsors, at the Underwater Photographer of the Year website. Click on the “full results list” link to access a slide show of all winning images in one album. Or scroll down to 2018 Winners Gallery to access photos individually along with details about the photos and photographers. 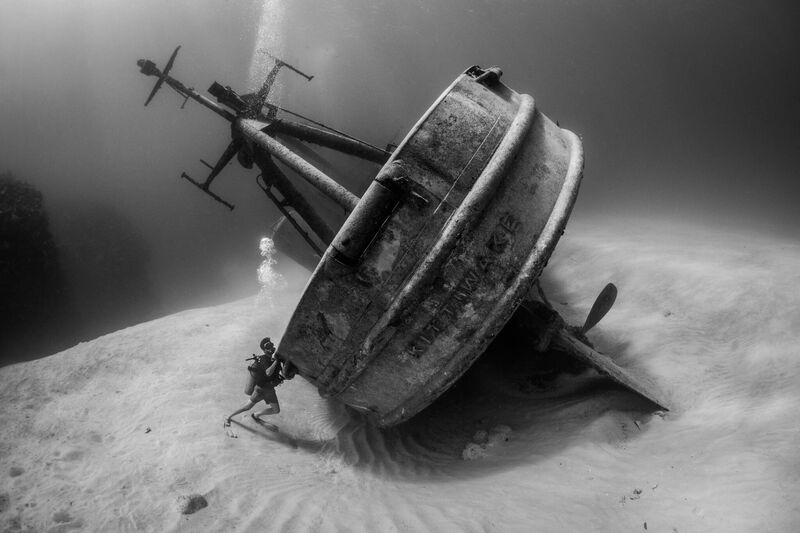 Cayman Islands photographer Susannah H. Snowden-Smith saw a humorous opportunity while documenting a shift in the position of the ex-USS Kittiwake. “OCD Diver Tries To Right Shipwreck” was Highly Commended in the Wrecks category. The Kittiwake, originally sitting upright, had been rolled onto its side by Hurricane Nate in 2017. A friend posed as the OCD-driven diver.